The new Fuji HS10 is one of a number of recent "bridge" cameras to hit the market that sports a super zoom lens- in the case of the HS 10 a whopping 30x magnification! 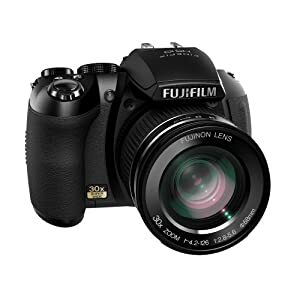 Providing the sturdiness and lens quality of a SLR with the ease of use or a compact is no mean feat - the Fuji certainly delivers in both areas, with some neat additions along the way, not to mention the zoom - did I mention that?! 30x!! The other big talking point with this model is that it now sports HD video recording on board. Using a dedicated control button on the back of the unit, combined with the positionable LCD screen makes this actually a great little shooter, running a full 1080p spec on board. Using this in conjuction with the zoom lens means that it can actually has many advantages over using a straight forward HDD Cam, as white balance control and B&W filming are all within easy reach. It also packs a lot of othe neat little tricks - here is the PR spiel.. So is the HS10 worth the £399 you are going to shell out on it. The answer is - kind of. As a HD camcorder it actually performs really well, the motion is smooth and the 10FPS stands up to quite a lot of movement. Actually using this as a SLR however is not so plain sailing. I am not a big fan of EVF's (Electronic View Finders) as they are essentially very small LCD screens viewed through a little black box! Not exactly ideal for shooting anything up close, or at distance - which if you are buying this for that whopping built in optical zoom, kind of defeats the object. All in all if you are looking for an alternative to a standard HD Cam then take a look at the HS10, however if you are looking to enter into the DSLR market I would consider doing just that!